It is sweet sounding but also aggressive. It can support a song in a percussive and rhythmic way or can create a vibrant sense of harmonic and melodious colors. It is the vibraphone - an instrument invented in the United States in the early 1900s and popularized throughout the history of jazz by the varied styles of legends like Lionel Hampton, Milt Jackson, Bobby Hutcherson, Cal Tjader and Terry Gibbs. Harris, in his 30s, who has an ear for creating brilliant colors and an expansive palette of sound, enlists the talent of only nine players - Harris (vibes and marimba), Junah Chung (viola), Louise Dubin (cello), Anne Drummond (flute), Greg Tardy (clarinet), Steve Turre (trombone), Xavier Davis (piano), Derrick Hodge (bass) and Terreon Gully (drums) - to establish a textured and orchestral sound trademark of Ellington. Harris was born in Albany, N.Y., and began playing piano at the age of 6. By the time he reached middle school, he not only played the clarinet but percussion instruments as well. In high school, he garnered the esteemed principal chair as percussionist with the famed Empire State Youth Orchestra. Harris later earned his bachelor's degree in classical music and his master's degree in jazz performance from the Manhattan School of Music. Since then, he has earned several Grammy nominations and Jazz at Lincoln Center's prestigious Martin E. Segal Award. Harris is also deeply committed to music education, conducting more than 100 clinics and lectures each year at schools and colleges across the country. In 2002, he was the resident artist at the Isabelle Stewart Gardner Museum in Boston and fills the same role at San Francisco Performances. The Beach Reporter recently spoke to Harris about his new work that highlights his talent as a composer and arranger. The Beach Reporter: How do you view the differences in arranging as opposed to composing? 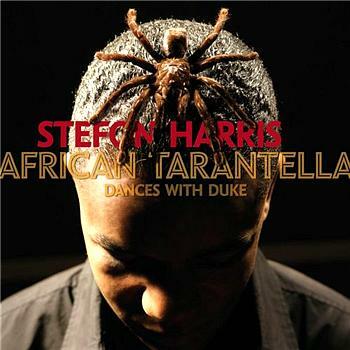 Stefon Harris: There is definitely a difference, particularly on this record. When I was working with Ellington's music, I was consciously trying to maintain the general character of his music and in arranging it I tried not to change things too dramatically. There were things here and there that have my sound on it as well, but the idea behind the record was to make sure there was a juxtaposition of Ellington's writing with my own. There are musicians who are always playing Ellington's songs and dedicating entire albums to his compositions. What is your approach to recording songs written by someone as talented and popular as Ellington? For me, the reason I am doing this is obviously musically based but also culturally based, I think, in that as an African-American jazz musician, I recognize that I am really part of a great lineage not only musically but culturally. That was my initial reason for digging into the music of Ellington and finding a lot of common ground there. Because I feel I am part of a lineage, I feel that I don't have to do it the same way it was done in the past. So, when I get a group of musicians together I tell them to play it how they would play any other piece of music - bring all of your personal experience and expressions; I never would say this is the way Ellington would play it on the piano or something like that. A lot of it has to do with a certain amount of freedom in your mindset when approaching the music. You seemed to have picked Ellington's compositions that were similar in theme to your pieces. I picked the Ellington pieces that I gravitated to most naturally, the sound of the pieces I feel very at home with as an improviser, playing in the middle of that harmonic environment that Ellington created. The album has a large, orchestral sound but it is a relatively small ensemble. Was that kind of your intent? Well, there are always budget concerns (laughs). I absolutely tried to take nine musicians and at times make them sound as large as I possibly could and there are arranging techniques that I experimented with to create that type of effect. But also the selection of instruments, I think is a very interesting combination of sounds that breeds a lot of variety. Normally you have sections and I tend to not like sections of anything - I don't want three trumpets, I don't want three trombones, I don't want five saxophones, I don't like the sound of it, it's overwhelming. Music to me is about color and nuances and emotional energies, and when I have strings, woodwinds, brass, the vibraphone and all the percussion, it's a very wide palette for me to draw upon. Ellington, for me, is the epitome of elegance and grace, so of course I needed strings to express that.